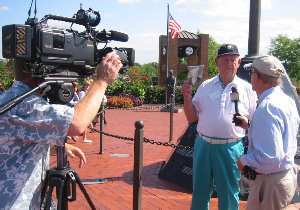 Sylvester Bolander, a survivor of the sinking of the destroyer Callaghan by a kamikaze plane, and his family hosted the 2007 USS Callaghan reunion in Fort Mitchell, Kentucky, a southern suburb of Cincinnati. The destroyer sank at 2:35 a.m. on July 29, 1945, after a slow-moving kamikaze biplane with fixed landing gear carrying a bomb hit the ship about two hours earlier. The attack caused the deaths of 47 crewmen and one officer, and 73 men were wounded. A few survivors attended the first Callaghan reunion in Indianapolis in 1972, and many more went in 1975 to the next reunion in Chicago for the 30th anniversary of the destroyer's sinking. Reunions took place at least every other year until 2001, when the survivors decided to have annual reunions. Former Callaghan crewmembers or family members sponsor each reunion near their home. 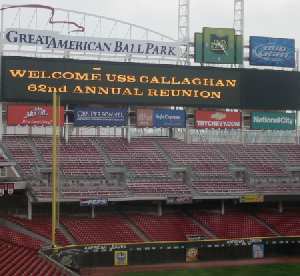 Almost 80 people, including 17 Callaghan survivors, attended all or part of the 2007 reunion from August 29 to September 2. 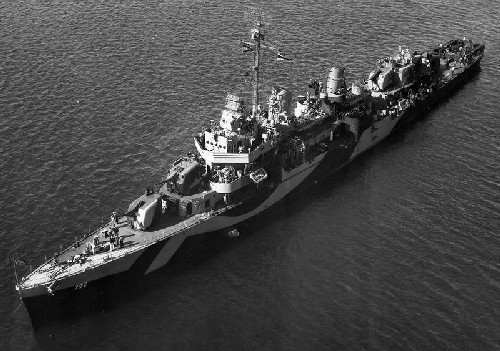 USS Callaghan (DD-792) earned eight battle stars for distinguished service in the Pacific War after her commissioning in November 1943 until her sinking in July 1945. The destroyer shot down 12 Japanese aircraft and sank a midget submarine. On May 25, 1945, Callaghan gunners shot down a kamikaze bomber, but two of the three crewmen survived the crash into the sea. Captain Bertholf ordered the ship's boat to go to the crash site to recover survivors. Doctor Parker treated the two wounded Japanese airmen, but one died a few hours later due to extensive injuries. The other man recovered consciousness, and he was transferred to the battleship New Mexico as a prisoner of war. On July 29, 1945, Callaghan was at Radar Picket Station #9 west of Kerama Retto when hit at 12:40 a.m. by a kamikaze plane reported by survivors to be a biplane with floats. The fires caused by the explosion of the plane's bomb ignited the ship's antiaircraft ammunition, which exploded about five minutes after the plane crashed. Captain Bertholf soon gave orders to abandon ship, but he and a small group of volunteers remained aboard to see whether they could save the ship from sinking, but he too had to be transferred to LCS(L) 130 at 1:43 p.m. when it became clear the ship could not be saved. Ironically, the kamikaze plane hit Callaghan less than two hours before she was to be relieved by the destroyer Laws in order to return to the States for an overhaul. Callaghan was the last of 49 American ships sunk by kamikaze attacks. Barry Foster, son of Callaghan survivor Allen Foster, has written a complete history of the ship entitled The Last Destroyer (2002) based on official Navy records and survivor interviews. 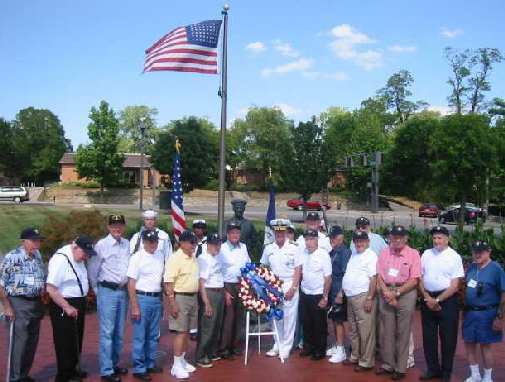 The memorial service in honor of USS Callaghan DD-792 took place on Friday afternoon at Bicentennial Veterans Memorial Park in Blue Ash, a northeast suburb of Cincinnati. The park includes ten life-size sculptures that represent the major wars in which the US has been involved. The Treble Chorus from Taylor Elementary School in Cincinnati started the ceremony with four songs, including "You Are Our Heroes." Rear Admiral Miles B. Wachendorf, who grew up in the Cincinnati area and now works in Washington as Chief of Staff of the US Joint Services Command, spoke briefly to give his appreciation to the Callaghan veterans who had served their country in defense of liberty. Two grandsons of Sylvester Bolander read the names of the 47 crewmen and one officer who died on Callaghan in the attack, and a bell rang after the reading of each name. Rear Admiral Wachendorf and Sylvester Bolander then went in front of the sailor statue at the park to present a wreath in honor of the men who served aboard USS Callaghan. The memorial service also including the playing of Taps by a bugler, a color guard presentation, and two songs sung by the director of the Treble Chorus from Taylor Elementary School. The Callaghan reunion included many planned activities. Thursday started with a tour of the Cincinnati Reds Great American Ball Park and the adjoining Hall of Fame and Museum. The electronic scoreboard welcomed reunion attendees, and a few lucky persons got to swing at balls thrown by a member of the coaching staff in one of the two inside batting practice areas. Next came a luncheon cruise on the Ohio River, and then a bus took us on a tour of Cincinnati. Friday began with a visit to the National Museum of the US Air Force at Wright-Patterson Air Force Base in Dayton, and the trip included a visit to the Presidential Aircraft Gallery that houses planes used by prior US presidents. After lunch at the museum, we went to Blue Ash for the memorial service. A banquet was held at the hotel on Saturday evening, and each Callaghan survivor in attendance received a plaque for his dedicated service aboard the destroyer. Marvin Bayless, a Callaghan veteran who traveled from Oregon, received the flag flown at the US Capitol on July 29, 2007, as a prize for being the Callaghan survivor who traveled the longest distance to attend the reunion. A hospitality suite remained open at other hours during the reunion so veterans and their families and friends could gather to reminisce, renew friendships, and take a look at the many photos of prior reunions and various historical information related to Callaghan's wartime service. When general quarters sounded at 12:20 a.m. on July 29, 1945, after a group of enemy planes had been detected on radar, Electrician's Mate Bob Cooper left his regular station at the aft switchboard to go to his battle station at the forward half of the ship as part of the damage control party. Harry Smitherman had the aft switchboard as his battle station, so he replaced Bob when the ship went to general quarters. Harry lost his life when the kamikaze plane hit Callaghan, but a metal sheet between Bob and the exploding plane saved his life. However, shrapnel from the explosion hit Bob and caused seven wounds and ten punctures. One piece of shrapnel poked a hole in his life belt making it useless, but this probably saved him from the shrapnel going even deeper into his body. He thought his life was over when the plane exploded on the ship. He jumped into the sea and dog paddled in the water covered with oil for about 45 minutes until picked up by a small landing craft, often referred to as a "pall bearer." He was transferred to the hospital ship USS Crescent City, where one or two days later he had an operation to remove two pieces of shrapnel from his feet and two from his leg. He then transferred to the Fleet Hospital in the Philippines, where he stayed about four weeks for recovery until his return to the States. Bob says that even today memories come flooding back and he gets nervous when he hears airplane engines, such as those of crop dusters in his home state of Iowa. That day they would sail for home. Oh why did it have to happen? This question will be asked for years. Singing Daddy (pitty-toon) would come home. To reach them with our love and care. And should not have been over there. And called you to a better home. holding up a photo of himself in the Navy. Leo Jarboe had served as a swimming instructor prior to his service on Callaghan, so he had no problems treading water for about six hours without a life jacket after the order came to abandon ship roughly 15 minutes after being struck by the kamikaze plane. On January 7, 1945, Leo volunteered for a rescue attempt of two Callaghan crewmen who had been washed overboard by a large wave while the destroyer was off the coast of Luzon. After another crewman exhausted himself swimming in the heavy waves in an attempt to reach the men, a line was tied around Leo, and he dove into the rough sea and swam toward the two men floating together. When he reached them, a winch pulled the three men back to the ship. Leo has attended all but one of the Callaghan reunions since the first one in 1972. He also hosted two reunions in Washington, D.C., including the one with the largest turnout when 72 Callaghan survivors attended in 1980. On May 5, 1995, Leo Jarboe met in Washington, D.C., with Kaoru Hasegawa, the kamikaze pilot who had been rescued 50 years earlier when his Ginga bomber (Allied code name of Frances) crashed into the sea after being shot down by Callaghan's guns. Leo invited him to attend Callaghan's July 1995 reunion in Pigeon Forge, Tennessee, to commemorate the 50th anniversary of the destroyer's sinking. They treated Hasegawa as a Callaghan survivor since he also had been on the ship although for just a short time. He expressed his thanks to the former crewmembers for saving his life, and they told him what they remembered about shooting down his plane and his subsequent rescue by the ship's boat. They found out Hasegawa led a kamikaze squadron of 12 Ginga bombers from Miho Air Base in Tottori Prefecture on May 25, 1945, but the rest of his squadron returned to the mainland due to heavy rain and low cloud cover south of the Japanese mainland. In the summer of 1997 at the Callaghan reunion in Rochester, Minnesota, former Callaghan Executive Office Buzz Buzzetti returned Hasegawa's watch to him. Buzz had kept the aviation watch in storage for over 50 years that he had taken from the injured Hasegawa at the time of his rescue. In 2000, Hasegawa showed his deep appreciation to the Callaghan crewmen by paying all expenses for Leo and the ship's two former Executive Officers, Jake Heimark (at time of Hasegawa's rescue) and Buzz Buzzetti (at time of Callaghan's sinking), and their wives for a ten-day trip to Japan. 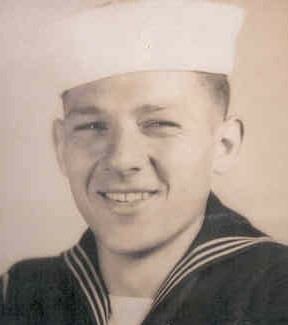 On July 28, 1945, Petty Officer 3rd Class Bill Hargis was on watch from 8 p.m. to midnight near his battle station at the 5-inch gun on the bow. Recently the Callaghan's crew had gone to general quarters several times, but they turned out to be false alarms. After his watch ended at midnight, he took off his pants and soon was sleeping on deck near the 5-inch gun until he heard the alarm sounding for general quarters at about 12:20 a.m. on July 29. He thought maybe the alarm would end soon as others had in the recent past, but he soon jumped up in his boxer shorts to begin loading shells into the 5-inch gun when he realized incoming enemy planes had been detected on radar. He could hear the droning engine just before the plane crashed and its bomb exploded at the after stack near the #3 gun mount. When orders came to abandon ship a few minutes later, he did not need to jump since water already had reached his gun mount. A gunner's mate named Henry Dunagan asked Bill for a knife to cut off a spare life preserver since he did not know how to swim. However, Bill did not have a knife on him since he wore only his underwear in which he was sleeping, and his pants with a knife in the pocket were below deck. Another crewman reported that Henry eventually found a life ring, but he was among the 47 killed or missing crewmen. Bill saw the "792" on Callaghan's bow disappear under the water about midway during the three or four hours he treaded water before being picked up by another destroyer. The thick black oil covering his body took several days to wear off despite being hosed down on the destroyer that rescued him. Chet Anderson served as radioman aboard Callaghan, so he was in the radio room at his general quarters station when the kamikaze plane hit. As the ship started sinking, he saw his friend Wilfred Wallace who had shrapnel wounds and no life jacket. Chet was wearing an inflated life jacket, so they went into the water together in order for Wilfred to hold on to his life jacket. After about ten minutes with planes still in the air, they reached a float with a few men hanging on to the side. Another destroyer picked them up after about four hours in the water, and they got hosed down to try to remove the oil covering them. Wounded men were transferred to the hospital ship Crescent City, and unwounded crewmen went to Ulithi, where they had the opportunity to write a short message to their families telling them they were safe. Chet has attended 12 Callaghan reunions, and at one reunion Wilfred's son came up to thank him for saving his father's life. 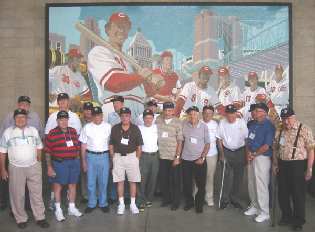 Callaghan survivors, family members, and friends left Cincinnati looking forward to the 2008 reunion in Waterloo, Iowa. Bob Cooper, with assistance from his eight children, will host the event.